Mentoring young startup teams is incredibly rewarding and a true passion in my professional career. I've worked as an Advisor with Desai Accelerator for almost 2 years now. In that time I've mentored 15+ startups over 3 Cohorts, delivered workshops and joined some of their advisory boards. 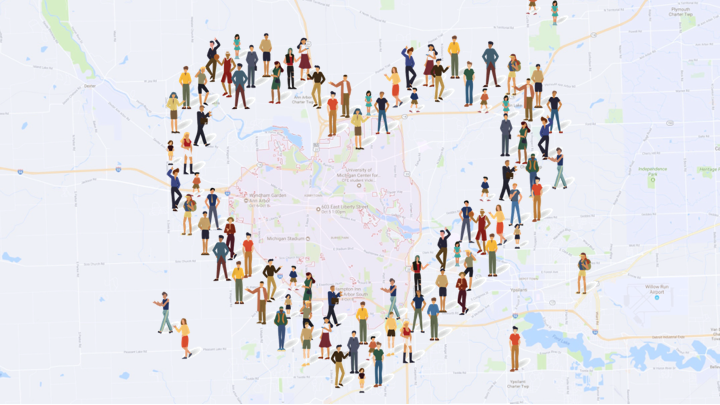 While Desai is based in Ann Arbor, Michigan and I live in the San Francisco Bay Area - I am incredibly drawn to the culture of sharing and passionate community in Ann Arbor. This year Angela Kujava, Managing Director of Desai, invited me to deliver the Keynote for Demo Day. Angela asked me to talk about how to nurture a thriving entrepreneurial ecosystem and community. Honored and humbled by the request, I resisted the easy route of presenting the "best practices" of other notable startup communities. My gut told me it was more valuable to explore how a community could identify and leverage its assets to build a virtuous cycle. This blog post is based on my Keynote which explores how a business model from another domain provides insights to building a thriving startup community. Very excited to share with a wider audience. You can watch the full Keynote video [about 13 min] on Desai Accelerator's YouTube Channel. Thank you for your time reading this post or watching the video. Your feedback is important to me. Let me know your thoughts! 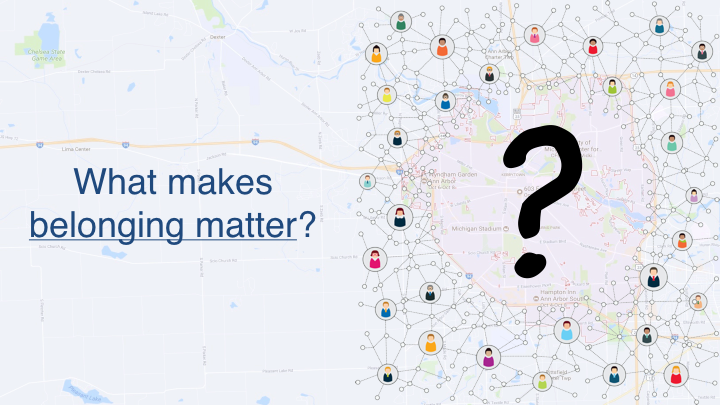 What does the Ann Arbor [Insert your Community here] Entrepreneurial Community do together that makes belonging matter? I live in the San Francisco Bay area and was completely disconnected from University of Michigan and the Alumni for 20+ years. But 5 years ago I was introduced to the University of Michigan Center for Entrepreneurship (CFE) which led to my relationship with Desai Accelerator. So I can help answer the question from my perspective. It's the set of Shared Experiences with others in the community that matter to me. Belonging to the Ann Arbor Entrepreneurial community matters because I love to work with fresh new founders, their companies. I love working with Desai Accelerator, TechArb Incubator and CFE teams who help students and founders level up their entrepreneurial game. The Ann Arbor Entrepreneurial Community is well established. More than a Community, it is an Ecosystem with several interdependent parts. We know the Ecosystem has world-class assets. AND, we know the Ecosystem has abundant potential. And that’s really the ultimate goal in nearly every endeavor: to realize the full potential. As I thought about this my curiosity led me to a different domain for inspiration. I looked at growth models for businesses thinking I could leverage a model for an ecosystem. And it didn’t take too long to find one most of us are familiar with. What if we used Amazon’s flywheel to drive a thriving entrepreneurial community? The flywheel effect is battle tested over decades. And no one can dispute Amazon is thriving and on an epic run. What immediately struck me about Amazon's flywheel was the interdependency of separate actors. Every activity and decision is aligned to Customer Experience - the catalyst of growth. You can read more about the flywheel in this wonderful article on Medium. Disclaimer: This is a rough first draft of a model based from a different domain. I’m not claiming it’s correct – I simply offer it up as a way to think about the Community as an Ecosystem with several interdependent elements. Since we're talking about a community, let's change customer experience to "Community Experience" -- the alignment force for the whole model. Following the Amazon flywheel as a guide, the first element of the flywheel is Quality Startups. The Ann Arbor ecosystem is already brimming with founders and their startups. With more Quality Startups, we’ll see more Investors, Accelerators, and Education programs. I knew each of these created an impact, but the one that surprised me were the Accelerators. You can learn more by reading this research on Regional Supply of Venture Capital and this research on the Accelerator Phenomenon. With more quality Investors, Accelerators and Education, you get more Knowledge, Experience and Capital in the ecosystem and churned back into the Community Experience. As the ecosystem thrives, you have more founders, startups, investors, accelerators, education and therefore more opportunities develop. The increased number of opportunities attracts more entrepreneurs into the community. And the virtuous cycle continues. Let’s double click on Community Experience. 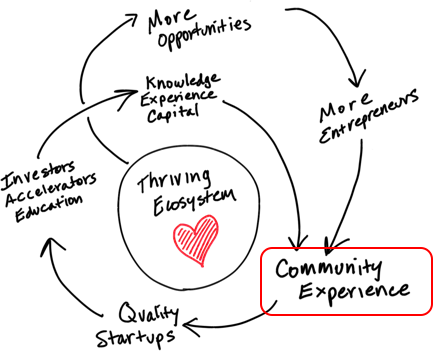 The Community Experience is the key driver of a thriving ecosystem. START a company? What is it about the community, the culture that makes it a great place to start a company? INVEST in a startup? What is it about the community, the culture that makes it a great place to invest in a company? Thinking through those questions should prime you for the most important question. What do you want the Community Experience to be? To answer that question, I believe you need to have a conversation within the community about the following three critical factors of the Community Experience: Core Values, Culture, and Shared Experiences. First - start with Core Values. To me, core values represent the fulcrum point in the decision making process. Defining these values, or first principles, empowers the community with a compass directing great decision making. What are the Core Values of the Community? What are the principles by which decisions are made? What culture do we want? If values are for decision making, then culture is the expression of those values. Put simply, Culture is how we treat one another. I suppose this is the one place I’ll offer a bit of Silicon Valley perspective. In Bay Area we have a “pay it forward” culture. The culture tends toward transparency, sharing and predisposition to help.My experience is the Ann Arbor culture is similar. What are the other defining characteristics of the Ann Arbor culture? Shared experiences the things we do together that make belonging to the community matter. Shared Experiences are the way in which we can experience the values and culture of the community. What activities promote a shared experience with people in and outside of the Community? The questions above are the foundation. Communities have many assets to leverage: Founders, Mentors, Investors, Businesses, Institutions, Accelerators. Beyond these assets – what are the UNIQUE ASSETS to leverage? 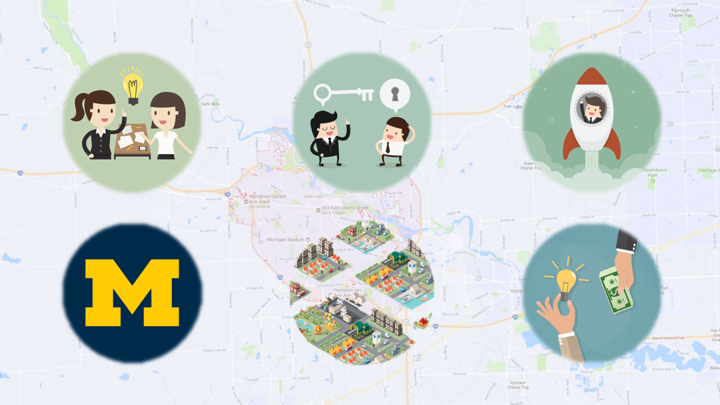 What are the UNFAIR ADVANTAGES of the Ann Arbor entrepreneurial ecosystem [Or for your Community]? You must identify and you put the assets to work. Idle assets are a Liability. Focus on students ”onboarding” into entrepreneurship. Ann Arbor is a University town and students are the renewable natural resource for entrepreneurship. Examine every way in which a student onboards into entrepreneurship. It’s the same type of examination of customers onboarding with a new product or service. What are the venues in which students can learn about entrepreneurship? What are the programs, events, clubs, communities at work to attract and retain new entrepreneurs? It is essential to create a beautiful onboarding experience for students considering entrepreneurship. It is a critical factor of the community experience. Note: My talk was focused on the Ann Arbor Startup Community with the University of Michigan as the main institution. I suggested the U of M students are the lifeblood of the thriving community. Your community may have a different "renewable resource" for which you should build a beautiful onboarding experience. Next - Hold a series of community discussions about values and culture of the Community Experience you want to create. Do not try to "boil the ocean" all at once. Instead start with small groups and build the groups over time. Keep it up and soon you'll be hosting real Town Halls inclusive of the entire community. I've learned from experience the critical factor is to create and maintain a safe environment for people to be vulnerable and share their ideas and experiences of the values and culture. Be intentional about creating that safe environment. And finally - Design and build new shared experiences with intent to reinforce your Community Experience, it's core values and culture. How does your Demo Day or Hackathon align with your Community Experience today? What can you do to improve alignment? 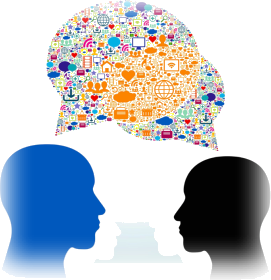 Consider shared experiences attractive to not only the Community but ”outsiders” as well. It’s not about competing with other regions for founders and investors. It’s about working with other communities to "grow the whole pie". Using the flywheel concept is just one of many possible ways to help better understand and leverage interdependencies in an entrepreneurial ecosystem. 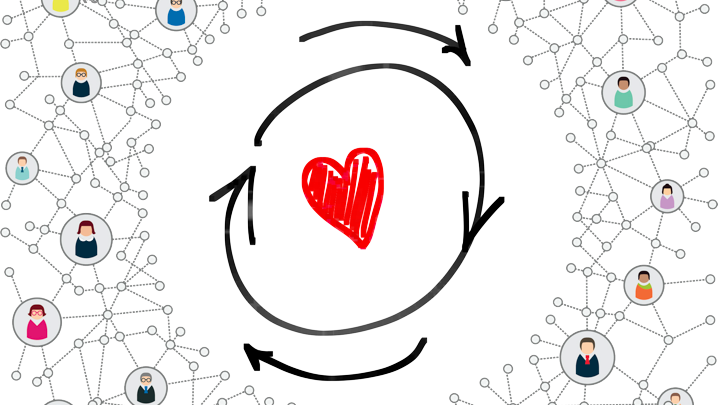 By aligning the actors and incentives to the Community Experience we can create a virtuous cycle that helps grow and empower the community and ecosystem. I'm interested in your feedback and thoughts on this model and what has worked for you!